Where is the Best Place to Purchase Business Domain Names? So, you’re looking to buy a new website domain name — Great! A website domain name (also known as a URL or web address) is like your Internet street address — It becomes an integral part of your branding, and it’s the way that people easily navigate to your site. As simple as it sounds, the act of buying a domain name can be overwhelming. There’s a plethora of domain registrants, and it can be hard to tell them apart. So, where do you shop? In this post, I’ll share the 4 best places to buy and manage business domain names. Let’s dive in! Bluehost is one of the most well-known registrars and they’ve continued to improve their product and service offering. You can count on Bluehost for consistently low prices, quality support, a money-back guarantee, and lots of add-ons and bonuses (which may or may not be useful). Additionally, Bluehost has an easy-to-navigate site and doesn’t clutter the interface with all kinds of up-sells and unrelated offers (a refreshing experience). You can get what you need quickly, and at a great price. I personally recommend Bluehost every time for a hassle-free, low-cost experience with great service. There’s really not a down-side to buying from Bluehost, but their promotional prices don’t apply to renewals like they do to first-time registration, so be aware of that. Almost all registrars are in the same boat on that one. GoDaddy is probably the best known of Internet registrars, but it’s not because they have superior customer service, products, or services. Most people know of them because of their controversial Super Bowl commercials. Regardless, they do offer acceptable service at a reasonable price, so we still recommend them. 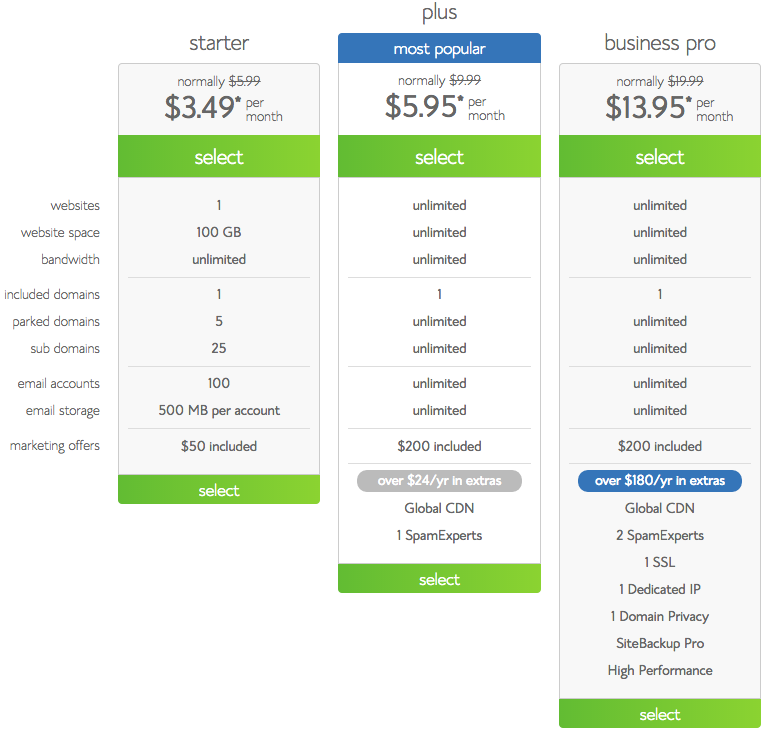 GoDaddy is reasonably priced, and it’s pretty easy to find discounts for domains across the web (updated 7/5/2014: GoDaddy has ditched a lot of discount codes and now offers a “Discount Domain Club” where you pay a premium for access to the same discount codes that once were freely available). GuavaBox has worked with GoDaddy quite a bit, and we’re always satisfied with their reliability and service. Without consideration for their advertising, GoDaddy’s biggest flaw is their effort to push unnecessary products on you while you are trying to buy a domain. Chances are that you don’t need, and will be disappointed by any email, website, or hosting that you buy from GoDaddy. This can sometimes betray customer trust, so other emails from them may seem like solicitations for upselling (even if they’re important). This registrar is also reasonably priced, but it lacks the controversial commercials. Name Cheap is a well-trusted registrar. They offer discounts on long term registration, and they’re a great vendor of secure socket layer (SSL) certificates for businesses with a priority on transactional security (banks, e-commerce sites, etc.). There’s less upselling, and they were selected as the #1 domain registrar by Lifehacker. You pay a bit more for .com’s and .org’s than GoDaddy, but otherwise they are pretty great! Okay, okay. We just had to plug ourselves in this post. No, we’re not a registrar, but we’re happy to buy and manage your domain on your behalf, worry-free! We manage business domains every day to make sure that they are up-to-date and provide WordPress-optimized hosting, backups, and security. Plus, our most basic hosting package comes with 6x the storage of GoDaddy’s deluxe package. If you don’t like working with people, GuavaBox probably isn’t your best option. Plus, in fairness, we do charge a bit more than other providers to account for the attention to detail we have for each individual domain and hosting account. Getting a new domain and finding web hosting can seem like a drag, but we recommend the vendors above to ensure that your time isn’t unduly wasted. Have further questions about domains? Get in touch. We’d love to help you out.